Assuming that you do not have the superpower to magically stop rain, make the wind blow opposite of your windows or tell pests to find another place to hang out, it is clear that you cannot eliminate any of the above-mentioned factors. However, you can keep them at bay with a few simple but effective cleaning hacks. If your window has not been well-washed, then it will get dirty in no time. Hopefully, you have used the services of an equipped and trained team of cleaning technicians. If that is the case, then skip to the next tip. If not, remember to clean your windows with a solution of equal parts warm water and vinegar. Use a squeegee to remove the excess water from the glass and then dry them up with a paper towel. That should keep streaks and grease away. The rain repellent is a type of cleaning product that was originally designed to help car owners enjoy greater visibility when they drive in rainy weather. It usually comes in the form of a spray and it makes water roll away from any glass surface. To apply it, you just need to spray the window, let it soak in for a short amount of time and wipe it all off with a microfibre cloth. Typically, the repellent’s effect can last for up to 2 months and it can easily be reapplied at any given moment. Windows screens are great at keeping bugs out of the house. However, they are also good at making your windows dirty since they trap rain, dirt and whatnot. That is why it is recommended to remove them during the colder months of the year when windows stay closed for the better part of the day. 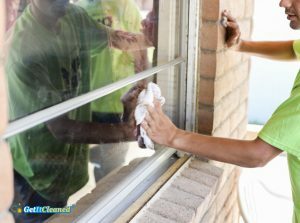 Screens and curtains attract dirt and dust and they can make all your efforts to maintain your windows eternally clean futile. So, try to clean them as regularly as you can. You can use professional cleaning services to sanitise your curtains or you can simply vacuum clean around the windows. Wipe up your windows sills too as they can also trap dirt.